With the rules out, I was hoping to gain additional clarity on how exactly to use each part of the prelude cards when setting up a campaign game, but to my dismay the rules have less details than the actual preview articles when it comes to prelude cards. So, my question is which part of the prelude cards does one actually use for each stage of the campaign? The rules seem to imply everything, but the preview article specifically highlighted the portions of the prelude cards when it is the AO vs not the AO one. Is this last part active in both games when you have this card drawn? IE when Ithaqua is not the AO and then the next game when he is? There are also quite a few other AO prelude cards with this kind of structure, so clarity on it would be helpful. I would say you use that too. I encountered the same problem when I was reading the rules, but it does make it seem like the entire prelude is used (only you're always going to be using the AO that goes with the card, so the part about 'if x is not the AO, then...' is ignored. Since the Rumours from the North card has a separate part at the end that is "Then gain a hypothermia and clue & focus", I'd say you get those too. I agree that the preview articles seem more detailed than the rules themselves. I think it will become clear once we start to play. I'm imagining that we execute all parts of both prelude cards, it's just that a paragraph may have an indication that it only applies if X is the current ancient one. When in doubt, use The Grim Rule i.e. choose the option that is most detrimental to you. It's Lovecraftian, after all! Only ancient one specific preludes are used. They are put into play with their corresponding ancient one. If A is the Ancient One, do X. If A is not the Ancient One, do Y. Then for the first game of the campaign where this card is in play (assuming it isn't the card for the first AO) you do Y and Z (alongside any effects from the Prelude for the AO you are facing), then for the second game you do X and Z (alongside any effects from the next Prelude card). Thanks, all, for your input. Simon, I agree that this is possibly the most logical approach and how my group will play it. You do what the card says. If your first prelude card is Cthulhu and the second is Yig, then your AO is Cthulhu, so you apply the first with Cthulhu being the AO, and the second with Yig NOT being the AO. Top advice. EH is a very literal game, you do what it says, you don't do what what it doesn't say. The rules say "The game is played using two Preludes: one that corresponds to the current Ancient One and a second for the Ancient One that will be played against next game". No qualification, no modifiers, just "The game is played using two Preludes". So that's what you do. These are true points...but they're not what the OP was asking (or at least, are not completely what the OP was asking). The question being asked wasn't "do I do the stuff marked as only for Ithaqua when I'm not playing against Ithaqua?" The question being asked was "Where does the else if statement end? Is this sentence applicable to 'AO != Ithaqua' or 'Always'?" Yes, this is closer to what I was wondering. Some Prelude cards have very clear distinctions between when the AO is being used vs not, but some mix in other text before, in between, or after these clauses. I also interpreted the line break as a separate instance that was not part of the previous negative (if that makes sense), but was curious to see what others thought. Parts that I've put in brackets are optional for the template, but mandatory for the game, if they are present. The signalling seems to be standardized in that the AO-presence-dependent parts have clear "if present" or "if not present" clauses. Parts without this signalling are always mandatory. I was also puzzled by the lack of detail in the rules PDF, given that the FFG preview seemed to go into more depth. Looking over it again, though, I think the website preview is incorrect. The MoN rules pamphlet just tells you to use two Preludes (one for the current AO and one for the next). No details about which bits of each Prelude to use. So I would agree with the posters above--you should treat each paragraph as a separate case, checking for instances of 'If [name] is/is not the current AO...'. Fairly straightforward. On the other hand, the preview 'An Onslaught of Abomination' includes some confusing images of Prelude cards with highlighted paragraphs. I think this is the source of the trouble. The text here makes sense, but the highlights on the cards don't. 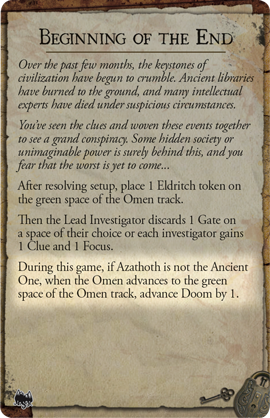 Just one example of an obvious error: Only the third non-italicised paragraph on the Azathoth card is highlighted. But surely that means you must do the first paragraph as well, since the Eldritch token on the Omen track is a reminder to advance the extra Doom during the game? And if that's the case, then we can't trust anything else about this preview example. Obviously the actual rules override the previews, which are just marketing/promotional blurbs and much more likely to contain errors. - all three non-italicised paragraphs of the Azathoth Prelude. 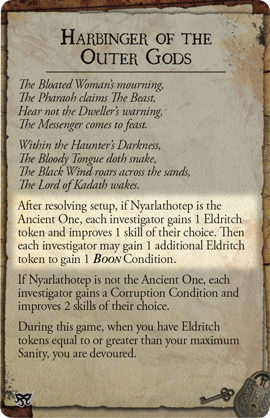 -After setup, each investigator gains an Eldritch token and improves 1 skill of their choice (and may gain an extra E token to get a Boon). -After setup, place 1 Eldritch token on the green space of the Omen track. -After setup, either the Lead Investigator discards a Gate or each investigator gains a Clue and Focus. -Investigators do not gain the Corruption Condition and improve 2 Skills of their choice (because Nyarly is the current AO). -During the game, you're devoured if you gain too many Eldritch tokens. -During the game, Doom advances by an extra 1 when the Omen reaches the green space of the Omen track (the Eldritch token is there as a reminder). Am I right in thinking the above is the proper way to resolve this example, and that the preview highlights are incorrect? Might be worth a rules query to Nikki? I don't have the expansion yet but I think If Nyarlathotep is the AO you would use the first and third non-italicised paragraphs on his prelude and all three non-italicised paragraphs of the Azathoth Prelude. After you win and set up the next game you would use the first and second non-italicised paragraphs of the Azathoth Prelude, draw a new second prelude and use whatever text is relevant for it's AO not being in play yet. I think the highlighted bits on the preview cards are just showing you which conditional elements are going to be used. But yeah it's sort of confusing and not really necessary. (a) That you are right in what should happen in the game. (b) That the way they probably meant this to be interpreted was not clear enough to everyone. I understand what they meant with the highlighting of the two paragraphs: Look, these you have to do. I think it would have been better to also have lowlighted the paragraph that would not be active in this game. If they would have accented all conditional paragraphs there (probably) would have been less ambiguity.